So far in this KantanMT blog series on Machine Translation post-editing we have looked at; automated post-editing, why it is becoming popular within the localization industry, how you can reduce your post-editing times, and the steps you can take to achieve both understandable or ‘fit for purpose’ and close to human levels of post-editing standards. In this post we are going to focus on perhaps one of the most difficult issues with regards to providing a post-editing service, and that’s pricing. LSPs and their clients must not only set a price, but also agree upon how that price is reached. Establishing a pricing framework that considers all parties is an imperative. So how can Localization Service Providers develop appropriate frameworks for pricing Machine Translation post-editing? TAUS, has recently published a public consultation entitled “Best Practice Guidelines for Pricing MT Post Editing” that features guidelines to help solve this problem. Let’s take a look at the key points. Note: These TAUS guidelines are preliminary and are subject to review while the public consultation is ongoing. TAUS says that no matter what kind of framework you use for pricing Machine Translation post-editing, there are certain things to always keep in mind. Ensure that your framework can provide an estimation of the cost of post-editing a text at the outset; re-evaluate prices when you evaluate or roll out a new version of an engine. When building your pricing framework, include all parties involved in your Machine Translation process. This is to ensure that everyone agrees “that the pricing model reflects the effort involved”. Consider the variables outlined earlier in this post such as post-editing different language pairs and post-editing to various quality standards. All of these factors need to be assessed as part of your pricing framework. TAUS recommends combining a number of approaches to build your pricing framework. These are Automated Quality Score (e.g. TER, BLEU, F-Measure), Human Assessment, and Productivity Assessment. TAUS adds that “Productivity Assessment should always be used” regardless of what approach is taken. There a number of combinations of automated measurement tools, KantanMT currently deploys BLEU, TER, and F-Measure. This involves steps such as human post-editors checking both the quality of raw Machine Translation output and post-edited content. TAUS defines this as “calculating the difference in speed between translating from scratch and post-editing Machine Translation output”. Speeds may change if you deploy a new engine, so each time a “new ‘production’ ready engine” is rolled out make sure that you perform new productivity assessments. 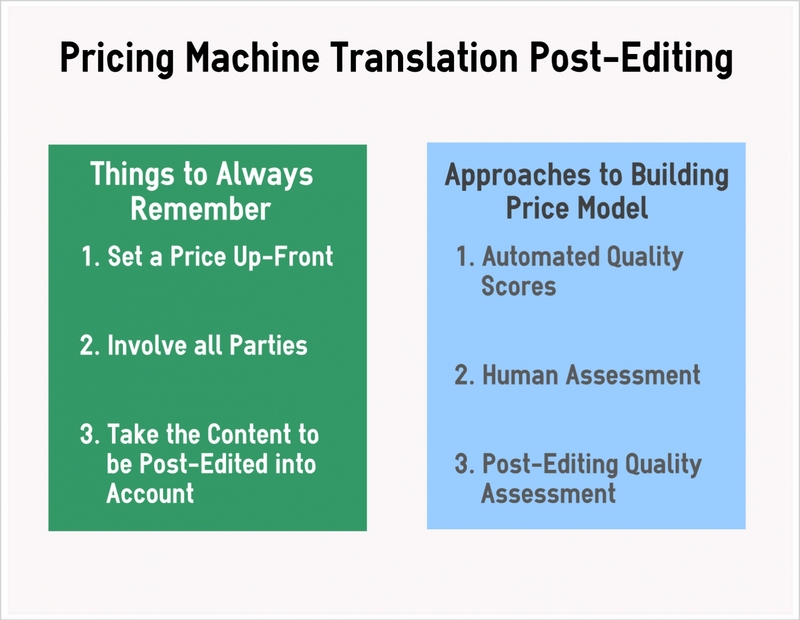 To find out more about developing a Machine Translation post-editing pricing framework, check out TAUS’s public consultation “Best Practice Guidelines for MT Post-Editing”. Note: The public consultation on these preliminary guidelines closes Tuesday July 30th 2013 and the official guidelines will be published on Tuesday August 6th 2013. This week, KantanMT has announced the forthcoming release of KantanMT Analytics. This technology, which has been developed in partnership with the CNGL Centre for Global Intelligent Content, provides segment level quality analysis for Machine Translation output. By attaining a quality score for each segment of a Machine Translated document, post-editors can accurately identify segments that require the most post-editing time and those which already meet the client’s quality standards. This will help KantanMT members to calculate post-editing effort and price. That brings us to the end of our blog series on Machine Translation post-editing. We hope you have enjoyed taking this “post-editing adventure” with us and are able to put the advice within this blog series to good use. Please feel free to comment on this post or any ones previous-we’d love to hear from you. If you want to find out more about KantanMT and KantanAnalytics, visit KantanMT.com or mail info@kantanmt.com.